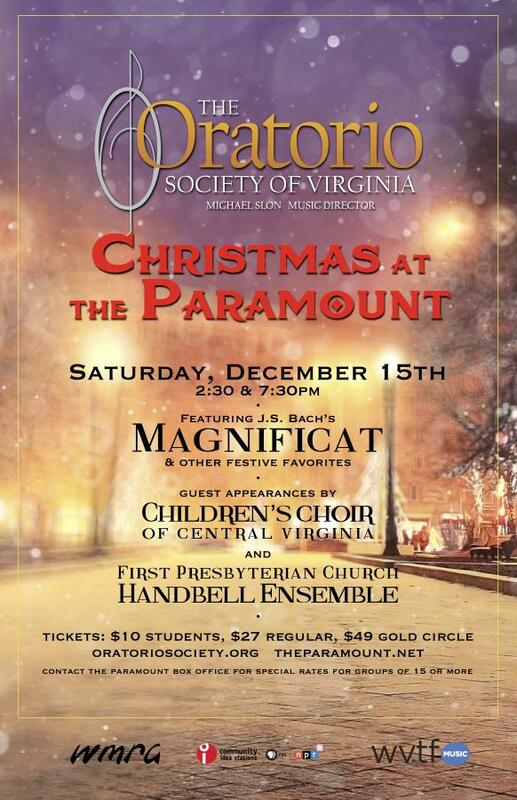 The Oratorio Society of Virginia presents “Christmas at the Parmount” on Saturday, 12/15 at 2:30 & 7:30 PM AT THE Paramount Theater. Featuring J.S. Bach’s Magnificat and festive holiday selections. The 90 member chorus will be accompanied by a full orchestra and 5 guest soloists. Tickets are $10 (Student/Child), $27 (Adult/Standard), $49 (Gold Circle/Premium). To purchase tickets, go to: http://www.theparamount.net/event/oratorio-society-virginia-presents-christmas-paramount-3/ or call the Paramount box office at 434.979.1333. Share in the warmth and musical beauty of an Oratorio Christmas!